Welcome back, gentle readers! While you’re helping make the world a better place with the Weekly Resistance, think about ways you can be kind to one another. Even a small effort to help someone have a more pleasant day can make a world of difference. Maybe that’s buying coffee for the person behind you in line, finally doing that orientation at the organization you’ve been wanting to volunteer with or bringing the receptionist at your office some nice flowers. Get adventurous! You can find information on how to contact your officials at all levels of government here. And if you haven’t had a chance yet, sign up for our newsletter to stay up to date on the latest! Congress is in recess this week, and your elected officials should be returning home to connect with their constituents, local officials and community organizations. This is a chance to get some face time with your officials, especially if they’re having a town hall or other public event. Contact your federal lawmakers’ offices to ask about their schedules this week. If they have no public-facing events, ask why not. And remember that you can always request a meeting, too. If the thought is a little intimidating or you aren’t sure what you’d like to say, make a list of issues that matter to you. And look up your lawmakers’ votes or public positions. Use those as a starting point for what you want to talk about. A rash of church arson in Louisiana is clearly racially motivated. The fires join a growing list of attacks on black churches, as well as mosques and synagogues. In recent years, we’ve also seen horrific mass shootings at Mother Emanuel AME Church and the Tree of Life Synagogue. This escalating violence is rooted in white supremacy. It’s goaded by elected officials who promote racist rhetoric — along with conspiracy theory websites, unchecked social media and much more. Report racist hate speech when you see it on social media. And when you see people making hateful comments, push back — but untag the original poster if you can. Social media sites don’t always take action on reports about white supremacist activity, as we know, but it’s important to get those reports on the record. Be equally assertive about filing reports at school and in the workplace. If you haven’t done so already, research local racial justice groups, and attend a meeting. Focus on listening rather than talking. Learn what people are working on in your community and how you can help. Talk frankly about white supremacy with friends and family. Consider doing a book or article reading club to explore texts on this subject — from memoirs to scholarly works. Definitely don’t ask friends of color to educate you; they have enough on their plates. Not sure where to start reading? Here’s a compilation of syllabi on racial justice topics to explore. Donald Trump’s purging of officials from the Department of Homeland Security and the decision to dump his nominee to lead ICE should be cause for concern. It suggests he wants to advance radical policy shifts that he thinks those already terrible officials wouldn’t implement. Or perhaps he wants to take immigration in a “new direction” that necessitates different expertise. That new direction in unlikely to be open borders. 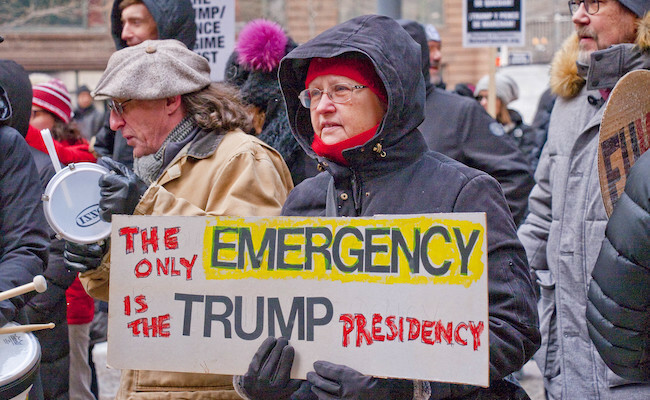 We know Trump is obsessed with his racist border wall, has threatened to “close the border,” incarcerates immigrants in growing numbers and constantly engages in inflammatory racist rhetoric targeting immigrants. It’s important to contact your representatives to let them know this is hateful and also harmful to national security and international relations. And while you’re at it, check in with the immigration policies being promoted by presidential candidates — if you can find them. Julián Castro is the only one with a coherent immigration plan so far. According to Politico, Democrats will be introducing an ambitious infrastructure bill this summer. This is exciting news, especially because the U.S. is facing a number of serious infrastructure issues that require a lot of money to fix. Knowing about this legislation in advance gives you a chance to weigh in as politicians are drafting it, rather than interjecting thoughts after the fact. And sometimes a simple comment from a constituent can totally reshape the way an elected official and their staff think about an issue. So take advantage of this week to sit down and think about your infrastructure priorities — from must-haves to pipe dreams. Contact your elected officials to share your thoughts. And know that infrastructure is a bipartisan issue with a lot at stake. So reach out regardless of party — whether you want more funding for the subway, fixes for crumbling bridges or modernization of the electrical grid (or all three!). Minnesota Rep. Ilhan Omar has been under relentless attack since she was sworn in as one of the first Muslim women in Congress. Much of those attacks have been rooted in the fact that she is a black Muslim who is unafraid to speak her mind and represent her constituents. And the attacks are escalating. A racist poster in West Virginia tried to connect her with the Sept. 11 attacks. And on Friday, the president tweeted a video of her superimposed over the Twin Towers. She has received death threats, and conservative “news” organizations are regularly attacking her. Political leaders should be stepping up to make it crystal clear that this is not OK — with no equivocations. The congresswoman and her staff shouldn’t have to fear for their personal safety in the course of doing their jobs. Unfortunately, many Republicans are joining the hateful rhetoric, and many Democrats have made anemic comments that fail to acknowledge how serious the issue is. Take some time to look up your lawmakers’ comments, and contact them to explain how you feel. Stop Trump’s Dirty Water Rule! Submit a Comment to Protect the Clean Water Act. Defending her indefensible comments will only encourage more of the same. I'm Jewish, ... yet I agree with most of what Omar (and AOC) say. The "complicated" part for Dems is to reconcile her anti-Semitism, her insensitive 9/11 remark, her opposition to the denial of insurance benefits for families of terrorists, and her general disdain for America, with the fact that the Left has anointed her based on her identity. I'm shocked by the gutlessness of Sanders, especially, along with Pelosi and others, in failing to jump foursquare to Omar's defense when her life is obviously in danger. Defending this is indefensible. She should apologize. It is all about her rather than the issues and she is divisive. I stand behind her 100% Representative Ilhan Omar is standing up for human rights. Dan B. - I am not being allowed to access the NY Times site at this time because the subscription I paid for has expired and I have not renewed it. I currently subscribe to my local newspaper, which is excellent, Mother Jones, The New Yorker, and many others. I'm thinking about renewing my NY Times subscription but don't have time to think about that right now. However, if memory serves me, please look at the bottom of the page for the box that says "comments," and then click on it. In my case, the comments appeared on the right side of my screen. I believe they were contained in a box with a blue background --although I'm not positive. I'm sure you'll find it if you look for it. There were around 768 comments when I looked. Dan, you don't have to compare her to trump. There is no comparison. One has great power and a global platform and a large racist base. The other is having her words interpreted, or more likely misinterpreted, for her by a phony news organization and a childish president who will destroy, or use as a diversion, anyone who happens to take the limelight away from him or whose skin color is not quite as white as he'd like. Thank you. I went back to the Times article, but could not find the comments. Perhaps, I missed them, and you could enlighten me on where I might find them. The factcheck link mentions one quote about allegiance, of which I was not aware. It does allude to her previous quote and apology. It does not mention her most recent statement. As I replied to Rhoberta, I am not comparing her to Trump. It is not a matter of choosing one over the other, and I will not do so, unless they are running against each other, and are the only two names on the ballot. I will assess her on her own merits. I do not think that anyone can deny that her comments are divisive. Anyone that makes these types of comments, should expect some backlash. I believe that she is intelligent, and knows exactly what she is doing. Just look at her fund raising efforts afterwards. Some people gravitate to these type of people, and will support their efforts. The same happens on the right. I will not support either of these, as mentioned numerous times here. "We've previously covered deceptive claims about the Minnesota Democrat's religion, her election and her commitment to the U.S. Constitution. The latest work of fiction about Omar - one of the first two Muslim women elected to Congress - uses a doctored quote to cast doubt on her fidelity to the U.S...."
Dan B. - Thank you for providing the link to the NY Times article about Representative Ilhan Omar. After I read it, I took the time to read some of the comments left by some its readers. I think you might be interested in reading them, too. If you're open-minded, as I believe you are, you might just be affected by what others have to say about this woman and how her life experiences and culture might have affected her. What's trump's excuse? He heard an opinion on what she said in an extemporaneous speech while he was watching the Fox & Friends' Clown Show and saw an opportunity to take the onus off himself during these difficult times that he created for himself. (Always an opportunist and always the master of diversion.) So he went on the attack and now this poor woman, who escaped from civil war in Somalia with her family at the tender age of 8, is being plagued with death threats. It seems this woman can't escape hate. Yes, a pancake has two sides. American politics has many. More Americans consider themselves Independents than are affiliated with any Party (42% as of the latest Gallup poll). Because I attach myself to this (largest) group, and not to a political party, you call it wishy washy. You want me to support one of the two major parties. I refuse to do so. Similar, I do not need to decide between support Omar or Trump. Not everything is black and white, right or left, one side of the pancake or the other. The world is not so simple. The same is true in climate science; I am neither a denier nor an alarmist (as they call each other). Rather I look at what the scientists have concluded. By the way, science is not a matter of belief. Belief implies blind faith. Science does not work that way. Science is the process of researching, gathering evidence, and arriving at conclusions - which can (and do) change with new evidence. Voted FOR the Democrats in 2016 !! Can't mention that often enough after all his hate / blame posts. Is that your argument? That I "have to win". ? It isn't about winning dan it's about human beings not doing or saying what YOU think they should say. Undoubtedly it's too late for trump but it is NOT too late for a young woman (regardless of party affiliation) to realize that HER WORDS MATTER TOO !! Maybe she WILL decide that dealing with all the hate filled rhetoric at the top is too much and change course in her career. I have been on you for 3 years because usually you are so wishy washy about everything, it's hard to tell which side of ANYTHING you are on. I guess that gives you an out in this matter. It's like your stance on climate change and your go to science posts. I'm sure you actually believe them. I digress but my point is as Dr Phil says, "A pancake has 2 sides"
Dan B That's true and it is because most of the Democrats are corrupt like the Republicans. AIPAC and the Israel lobby have paid off most of the politicians from both corrupt parties, so the fact that most of the Democrats are not defending Omar proves how corrupt most of the Democrats are, not Omar. Please go to opensecrets.org and see the large amounts of money from Wall Street, corporations, banks, and law firms that politicians from both parties have received. The Democrats are just as corrupt as the Republicans. You may be interested in this analysis from the NYTimes, where her support from within her own party is rather tepid.